"The Duck is indeed, rather Wayward." The Wayward Duck is the story of an individual, rejected by her homeland and her culture, and has found herself a new home with a group of mismatched individuals. Two groups, actually. She balances both her lives rather badly. Her path is a difficult one, made even more so by her sudden involvement in a universe-wide fight against evil. Just an ordinary weekend, really. The Wayward Duck has not been tagged yet. 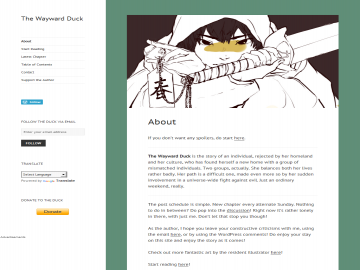 Help others find The Wayward Duck by tagging it! The Wayward Duck has not been reviewed yet. The Wayward Duck has not been recommended yet.